Best Noise Cancelling Headphones for Sleeping in 2018. Some people like to fall asleep in complete silence, others prefer falling asleep with music, special sounds and so on. Well, if you are in the second group you definitely need the best noise cancelling headphones for sleeping. However, it is not that easy to choose the best one for you. This is the reason why we have selected three products you can buy at the moment. Although this is a rather short list we are sure you will find your favorite headphones for sleeping. Let’s take a closer look at our list. They’re lightweight. Thanks to the silicone part that is not too firm, they are very comfortable. They have two microphones that control external noise. These are the first such handsets of this manufacturer so that the technology and chip these headphones use are unique and made especially for this manufacturer and this model of handsets. On the cable itself you have the ability to adjust the volume, noise cancelling, and you also have the option to reply to cellular phone. At the end of the cable there is a lithium battery pack that can be charged via a USB micro cable that comes with the product. It allows the battery to operate up to 16 hours. 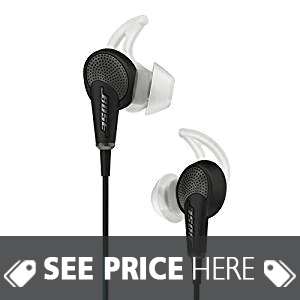 Bose Quiet Comfort 20 headphones are specially designed for Samsung and Android devices as well as for Apple devices. What you first notice is that noise cancelling works perfectly. Of course this doesn’t mean that you will not hear absolutely anything, if someone yells, or something breaks, or if you have a crying baby in the house you will certainly hear that. What is really nice about these headphones is the “aware” option. It gives you the ability, of course, if you turn it on, that when you are outdoors and someone speaks to you on the street or in the bus, plane, taxi or anywhere, you can really hear them very well thanks to this option. It’s a technology that exists with some other manufacturers, and here it works really well. The sound is pretty good, the bass is quite solid for this type of headset. What makes this model and this manufacturer particularly different from the others is the fact that thanks to the ergonomics of silicone pads, the headphones don’t drop out. They are very comfortable and you can wear them for hours without feeling any pressure. They are not just lightweight headphones, it’s all lightweight, the cable and the control bar, just like the battery. Some people have complained that when you have a sharp or dull sound coming from outside, such as a bang, a bus horn, when someone slams the door and so on, the sound in the headphones can become unpleasant at that point. The battery lasts for a very long time. You can really isolate with the noise cancelling option. When the battery is full you can use active noise cancelling, when it’s empty becomes passive noise cancelling. When you put them in, you do not have the feeling, like with the other handsets, like someone sucked the air out of your ear. They’re really very comfortable. They are very soft and comfortable, it suits for every head size. This is an interesting product, very accessible to everyone. It consists of a head band that goes to your head, actually forehead in which you put headphones which comes with it. It’s made of very soft material. Headphones are plugged into this headband, the headset itself is coated with a very soft material so it’s really comfortable. The cable cord is quite durable. It’s also washable, easy to clean and keep it hygienic. You can buy them in: black, white, pink and blue color.There are also different sizes. The people who tried them say that they are really cool. They are very comfortable, soft, lightweight. Sound quality is quite good, we can say decent, yet these headphones are meant for sleep, rest and relaxation. You can even use a soft head band to cover your eyes so you`ll have a complete comfort while relaxing. Some people complained that they were too tight. So if you have a lot of hair or a bigger head you have to check if there is a size that suits you otherwise you`ll feel unpleasant when wearing them. Cozy and comfortable to wear. Phones have adjustable speakers for a good fit, they don’t crackle as you move, stay in place though the night. It’s very handy, also very convenient as a gift. Definitely a recommendation. 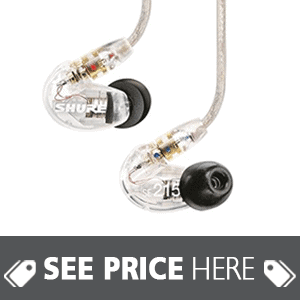 These Shure SE215-CL sound isolating earphones have superb sound isolation and can block up to 37 dB of external ambient noise. The technology used by this manufacturer prevents external noise from interfering with you while listening to music or resting. They have superior ergonomic design, very professional. They are lightweight, well fitting in the ear thanks to the nozzle angle that is optimized. They have a detachable cable that is reinforced. The connector is a gold plated MMCX and it can be rotated 360 degrees easily. You can buy them in two colors clear and black. Great sound quality, great fit and great finish line.This pair of headphones where designed for studio use so don’t worry about the sound quality. The sound is amazing, bass is great. Very crisp and warm sound. It goes over your ear so it’s comfortable when you are lying in bed. Because of the specificity of the foam tips when you put them and remove them you need to do this carefully. The cable is really long. Depending on where you use them this may be great but may also be a problem because it is too long. The cable itself, although very high quality, is not particularly flexible. Sound is good but not superior. Noise canceling is great. Bass is great, sub bass is acceptable, mids are also very good. Thanks to the foam sleeves you get with your headphones, you can easily adapt them to each size so that it fits perfectly. The cable is “indestructible”, we prefer black but clear is available too. Very comfortable, soft and practical. The material from which they are made is Lycra. This is very soft and durable material, rather pleasant on the skin. Also very lightweight. Speakers are very thin, they are removable and washable so it`s easy to maintain hygiene. They don’t put pressure on your ears when lying on the side. You feel cozy lying in any position. They have a very high quality and very durable cable.You can use them when walking or relaxing.On the cable there is a music control button that serves both for playing music and answering or rejecting the call. It uses 3.5 mm audio jack ( 1/ 8 inch ) so you won`t have trouble with compatibility with most devices. They are certainly much more comfortable than earbuds. The material is really brilliant, very soft, lightweight, almost you don’t feel it’s there. Also, you can drag them over your eyes and use them as a shading protection while you sleep. Noise cancelling option works very well. Sound quality is great for this type of sleeping earphones. Some people complained they were too tight. Although they are stretchable, if you have a lot of hair or bigger head you should check the dimensions before buying them. They are easy to maintain and easy to control the release of the music and respond to the call, they are quite durable but not irresistible, especially if we are talking about speakers. They are quite thin, very comfortable but this has its disadvantages regarding to durability. So you have to pay attention not to put too much pressure on the speakers in order not to damage them. Definitely a recommendation for this MMUSS Sleep headphones with mic. 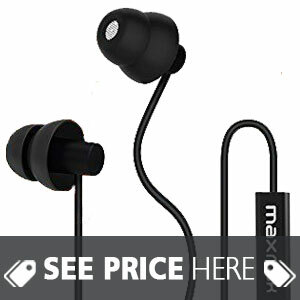 One of the best budget ear headphones we reviewed. One of the best silicon earbuds we tried. They are very small in size but thanks to the excellent silicone inserts they don’t often drop off and very gently fit in the ears. Noise cancelling works great. Not that we can say that they completely eliminate all the sounds coming from the environment but they reduce the noise significantly. The sound is clear, crisp and you have a microphone too if there is a need for one. They are very small, made of silicone.The material that is soft and that fits in ear very easily. It makes you feel comfort while wearing them. The sound is excellent. They do a good job of noise cancelling but not completely isolating outside sounds. You can use them while walking or jogging, independently of the weather conditions or season time of the year. They have a good bass. Some people complained that they are very small so sometimes they can fall out during the sleep, but those were individual cases. Ergonomics is great. You can easily sleep on the side, don’t feel you have them. No pressure when you fall on the pillow, no pain in the ears. very convenient for traveling and sleeping. They are great for people who have problem with insomnia, snoring, noises that come from outside (a neighbors who make a party, a neighbor dog or a cat ). They reduce the ambient noise or office noise, generally for relaxation and meditation. You can wear them all day long no problem. They are not professional earbuds for noise cancelling so don’t expect a miracle. All in all very good model and we give a great recommendation. The first and the most important, basic, thing when buying noise canceling sleeping earphones is that you have to keep in mind their primary purpose and that is – they are intended for sleeping. The most important thing, regarding to good noise cancelling headphones for sleeping is to be very comfortable because in all other cases, what they offer as an advantage will not be so pronounced. There is a need to pay attention to the ergonomics, the quality of the materials from which they are made, also there is a design issue. The way noise canceling works and how well it works is primary. The sound quality varies, depending on the manufacturer. This doesn’t mean that the sound is bad but you can’t expect superior sound in all aspects with a full sound range, because simply this is not that type of ear headphones. Advantages of using noise cancelling headphones for sleeping? In addition to using them when you are sleeping, you can also use them in other occasions. 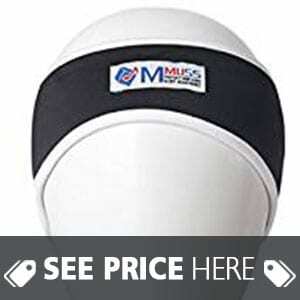 When working or learning, and you need maximum concentration and isolation from noise from the environment. We can’t say that they block all sounds, but the biggest part of the sounds coming from the environment is blocked. What’s good with this type of ear headphones is the fact that you don’t have to amplify the sound because you already have a noise cancelling option so you can enjoy music even when the music is quiet. That way, the sound becomes more natural, richer, and you feel the variations of music. How good is their primary option? Their primary characteristic is noise canceling. All the models we described are doing very well this job concerning noise. You can’t expect a miracle, some of the sounds can be heard, but most of the common sounds are blocked. In most cases, this is what manufacturers specifically take emphasize when designing and use the material which are very comfortable and soft. Of course there are different products on the market, some of them are more comfortable, some of them are less but usually they are cozy to wear. What is the right noise cancelling headphone for sleeping for me? It generally depends on what type of personality you are. If you are of those who are active at home and backyard, whether you rest a lot, or you are working and studying and ultimately whether you can concentrate on work or study during listening to music at the same time depends which noise cancelling ear headphones are ideal for you. It’s best to study their characteristics and find what’s suits you. This means that if you need the most comfortable ones, don’t buy the ones that have the highest quality sound and vice versa. These noise canceling earphones are a very practical thing. In addition to using them when you sleep and rest, you can also use them at other occasions. You are not limited to their primary purpose. The Bose Quiet Comfort 20 is the most popular model for us, but the price may make you think again. However, each of the models we have presented and described above have their advantages and a bit of flaw. In any case thumbs up for any of these models.